Mabuhay, Outpost Fam! Before you book your stay with us, please take a moment to read our property description. Very important information is disclosed below! 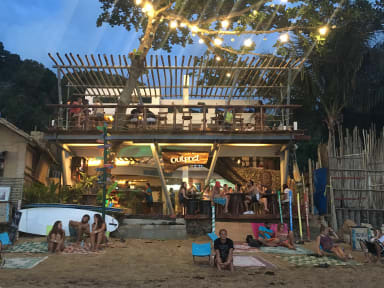 If you are arriving after 7PM, please notify us ahead of time, we cannot guarantee your bed if you do not; we are directly on Corong-Corong beach (aka Sunset Beach), NOT El Nido Town. We are a 5 minute tricycle ride to El Nido Town Proper. AS OF February 2019! WE NOW HAVE A PREFERRED FLEET OF TRANSFER VANS FROM PUERTO PRINCESA AIRPORT DIRECT TO OUTPOST BEACH HOSTEL! Reduce the stress and hassle of shopping for a van when transferring from Puerto Princesa! Just look for our "OUTPOST" sign outside of the terminal with Palaweno Tourist Van Transport company. Trips begin at 5:30am and end at 7:30pm every day! 500php/ person in SHARED VAN ~ 5-6 hour ride. 6000php/ PRIVATE VAN ~ fits 10 comfortably. A fun and social hostel located on El Nido's sunset beach. It’s all about comfort and being part of the lively vibe that is set at Outpost Beach Hostel. Laze out in the sun on our beach, chill in our beautiful lounge, or go island hopping with us and your fellow hostel friends during the day. Then, be part of the fun vibe at night with our bar fully opened. From the members of staff, managers, and owners, we are all present to assure you have a fun and comfortable stay whilst exploring the beauty that is El Nido. Come and join us for your stay in El Nido! Outpost is located in the southern sector of Corong-Corong Beach (the sunset beach). The sunsets from our property are one of the best the world can offer. All the islands and lagoons you would want to explore are right in front of us in Bacuit Bay. We are relatively isolated and in a more serene environment compared to El Nido town proper. 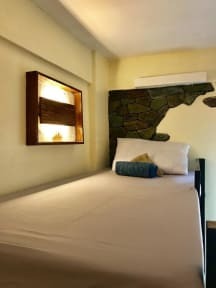 Our dorm rooms are very comfortable and clean, with air-conditioning and fan in each room, hot shower access, large lockers, individual electric sockets and bed-side light box. Although our rooms are nice, we do emphasize the fact that this is a social hostel. So if you want to just stay in your bed and not express yourself, this is not a hostel for you. We have a great restaurant on property led by Iron Chef Champion Chef Jeff. Breakfast, lunch and dinner are served daily and also BBQ nights every Sunday (Lechon BBQ during high season). We also have our own tour desk and boats. So, for all of those looking to explore El Nido’s beautiful islands and lagoons, we have the best tours to offer right here for you on our property. Aside from our lush rooms and beachfront, we have a very beautiful lounge with a PS3 and Nintendo 64. Our terrace is also available for chilling with a kickass 180-degree view. Come check us out! Salamat po! The island hopping tours we offer are A+B Combo and C+D Combo. We also offer land tours to Nacpan Beach and Kuyawyaw Falls. Only cash payments are allowed so please bring cash prior to your arrival to El Nido. For those arriving after 7:00 PM, please inform us via email or phone call otherwise we cannot guarantee your booking. There is a set of steep stairs you must go down prior to arriving at the beach. The tide may be high as well, making the journey from the road to the hostel difficult, especially with big bags. We would be happy to assist with the bags and the stairs. Please just let us know when you are at the road. Wifi is only available in common areas. El Nido experiences power cuts frequently (about once a day for about an hour). During these periods, power is suppled by our generator. Only fan and cold showers will be provided to the rooms during these times. Cancellation policy is 14 days. No-Shows will be charged in full. We are a DRUG-FREE hostel. Violators will be escorted on the spot with no refund. Once again, we are a social and lively hostel, so if you are in one of our dormitories and you are not going to mingle and share your experiences, this hostel is not a right choice for you. Children are not allowed to sleep at Outpost. We would also like to add that given that it is a vibrant hostel, we do not recommend this hostel for anyone older than 35 unless they are looking to mingle and have fun with fellow guests.